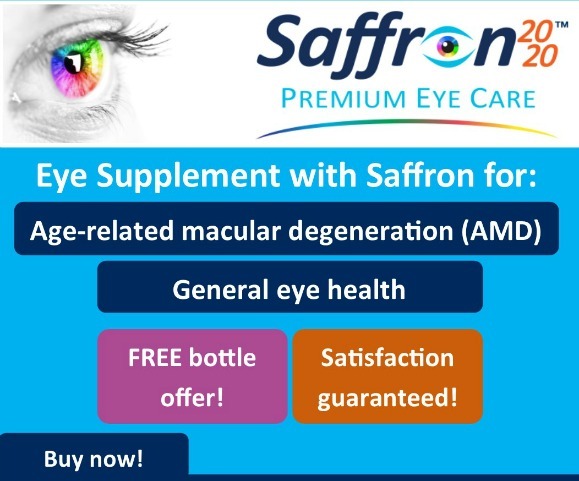 Dry Macular Degeneration is the most common form of age related macular degeneration (AMD). It is a retinal eye disease that affects what we see right in front of us. It often runs in families and in those over 65. Perhaps you have heard for the first time that you or your loved one has macular degeneration. Often times patients are given the diagnosis but then left on their own to find out what it means, how it progresses and what kind of vision loss is to be expected. What is macular degeneration? It is a retinal eye disease specific to the macula - a tiny spot in the middle of the retina responsible for our detailed and straight ahead vision. 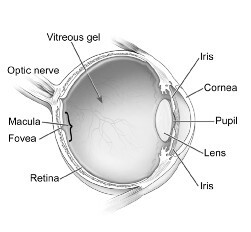 From this eye anatomy picture (from the National Eye Institute) you can see where the macula is located - in the back of the eye in the center of the retina. 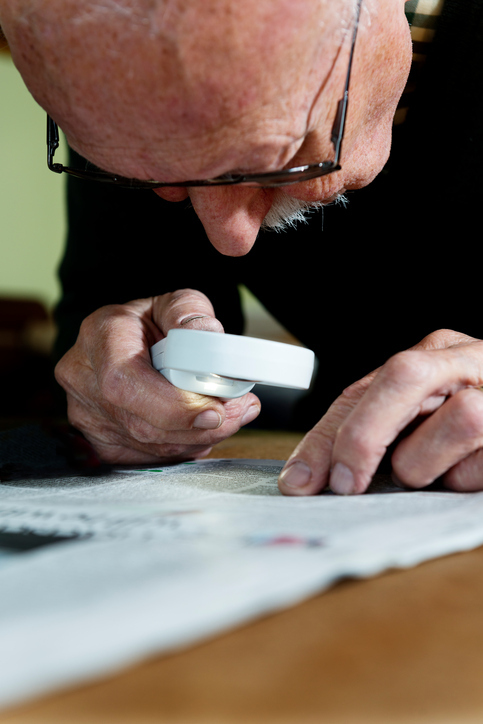 The macula provides us with our ability to see detail - such as reading a book or threading a needle. It also provides us with our central vision or straight ahead vision - like seeing a road sign or recognizing a face. 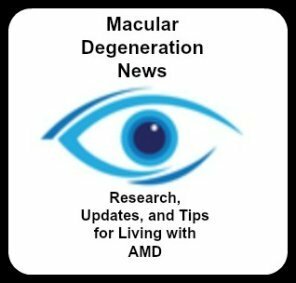 Dry age related macular degeneration (AMD) is given this name because typically it is a retinal condition that affects the senior population. The older a person is, the higher the risk he/she has for developing AMD. The dry form means that the eye has not developed fragile and leaking blood vessels under the macula which causes a more sudden and severe vision loss. Other names for this macular disease is atrophic macular degeneration or non-neovascular AMD. Perhaps you've realized that you need more light to read or that it's become harder to distinguish black from blue. Although these dry macular degeneration symptoms can accompany many aging eyes, they are also early signs of macular degeneration. The first sign of macular degeneration may be detected by your eye specialist during a routine eye exam. The development of age related macular degeneration is silent and painless which is why it is important to have regular eye exams. It is very important that yearly eye exams are performed to detect any early symptoms of macular degeneration or to begin treatment if any macular degenerative disease is detected. The first clue your ophthalmologist will have that you have dry AMD is the presence of drusen which are yellowish deposits of lipids (waste material) in the macula (the center of the retina). You can see the yellow specks in this picture from the National Eye Institute. There are actually two types of drusen - hard drusen which is less harmful and soft drusen which is an indicator of macular degeneration. The picture in the far right shows how the build up causes the normally flat layers of the retina (the picture in the far left) to raise which in turn distorts vision. Dry AMD has three stages and each eye may be in a different stage of AMD. It is believed that all macular degeneration begins with the dry form. People with early AMD have either several small, soft drusen or a few medium-sized drusen. At this stage, there are no symptoms and no vision loss. If persons are diagnosed with the early form of dry AMD, usually they are told that nothing can be done to reverse their condition or to halt its progression. Geographic atrophy is the third stage of dry macular degeneration. In addition to drusen, , people with advanced AMD, or geographic atrophy, have a breakdown of light-sensitive cells and nearby tissue in the central retinal area. This breakdown can cause a blurred spot in the center of your vision. Over time, the blurred spot may get bigger and darker, taking more of your central vision. You may have difficulty reading or recognizing faces until they are very close to you. 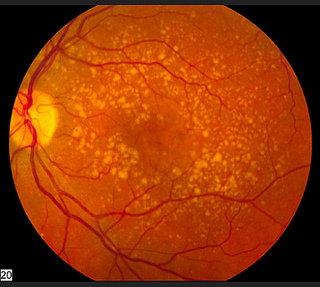 Dry AMD can turn into wet macular degeneration in 10-15% of those with dry AMD. 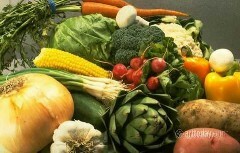 High concentrations of natural carotenoids can help protect the lens and the retina of aging eyes. 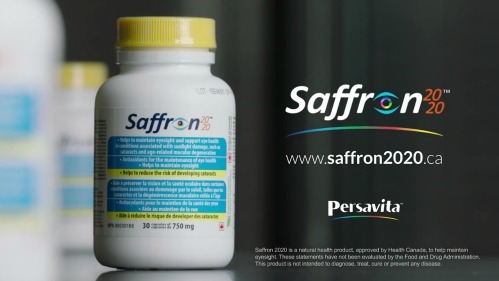 Dr Mahmood Piraee is the co-founder of Persavita Ltd. (Cambridge, UK), and is qualified as a pharmacist (Shahid Beheshti University of Medical Sciences, Tehran). He subsequently completed a PhD in molecular and cellular biology (Dalhousie University, Halifax, Canada). He shares with us how eye health nutrients may protect the retina and the lens of the eye from damage caused by oxidation. Although the dry form is the most common type of AMD, traditional medicine has little to offer. There are several clinical trials going on right now to find ways of intervening to slow it's progression. Complementary or alternative medicine treatments include herbs, microcurrent stimulation or acupuncture. 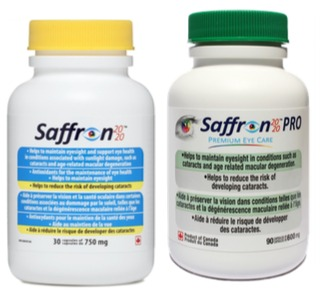 At this time there are no FDA approved medications for the treatment of dry macular degeneration. However, that doesn't mean that there aren't things you can do to help support the health of your eyes and your body. Plenty of research confirms the role of diet, lifestyle choices and nutritional supplements in the progression or lack of progression of this eye disease. How fast will my dry macular degeneration progress? Can dry AMD turn into wet AMD? Will my eye sight get worse? These are all great questions. The progression of AMD is different for everybody and different for each eye. Some people with dry macular degeneration may hardly notice any changes in their vision and it can remain that way for many years. Others may suddenly wake up one morning shocked to find that they have lost their central vision. The uncertainty of not knowing how or when one's macular degeneration will progress is a source of stress for many people. Learning about this retinal disease through books about macular degeneration can help you with lifestyle changes to help slow the progression of AMD or teach you how others are finding ways to cope and stay independent even with vision loss.